TechsPlace | Lotus Notes is one of the most prominent email client used in a business organization or an enterprise for communication with other business clients. IBM Lotus Notes stores entire email data in NSF file format. After releasing of Office 365, the migration of the Lotus Notes content is a very big task for a lot of enterprises and small businesses because O365 provides cloud computing along with a ton of features to explore their IBM data in exchange online. A number of Lotus Notes users are wondering to fetch the perfect migration process of Lotus Notes to Office 365 through which they can export their data into the cloud without losing a single email. The switching towards office 365 is rising day by day because Microsoft Office 365 provides the access you need, to operate it from anywhere. Why exportation of NSF data to Office 365 is Important? Here are many factors responsible to do a migration process from IBM Lotus Notes to Exchange Online and it will help the user to import their data to the cloud. Email Migration: Now these days’ people are using email conversion method to communicate with each other and sharing their ideas and data over email messages. It makes email data very important so the conversion of email from one platform to other should be accurate and safe. A small downtime occurs a big data loss for a big or small organization. It makes the email migration an important job for Lotus Notes to Office 365 migration process. Calendars: Just like emails, calendars are also vital subjects of exportation because meeting events schedules and important dates of notes are saved in the calendars. For a business organization meeting with their and other clients is important to grow their business so a scheduled meeting is a very important event. All the meeting data and attendees are stored in calendars which makes it crucial for the migration. Contact Address Book: In a contact book, all the clients and other important person’s details of an organization are stored which is used for a communication over mail or phone. Each and every field in a contact is important in itself so the conversion of them is also being important. Cost and Maintenance: The purchasing cost and maintenance cost of the Lotus Notes is higher than any other email client and to keep maintain their data in it is also tough for a tyro user because of its strong database technologies which a new user can’t understand easily. Time Consuming: IBM Lotus Notes is very slow for working on it. It pretended to like a snail of email clients (jokes apart….). The Lotus Notes provides a time-consuming migration process. To work on it is necessary to log in again and again for each account separately. User Interface: A GUI interface is the face of software which interacts with the user for the very first time and the graphical user interface of IBM Notes is not so good. For a user, it is hard to work on it. Let we start the IMAP Connection method to migrate Lotus Notes to Office 365 accounts. In this process there are following steps are need to follow. Step 1: Create a backup of the selected NSF file you want to migrate. Step 2: Create a new mailbox for every NSF file. Step 3: Enable IMAP TCP/IP port for all the active IBM users. Change the TCP/IP Port value and store it. Step 4: In the last connect it with IMAP Connector. 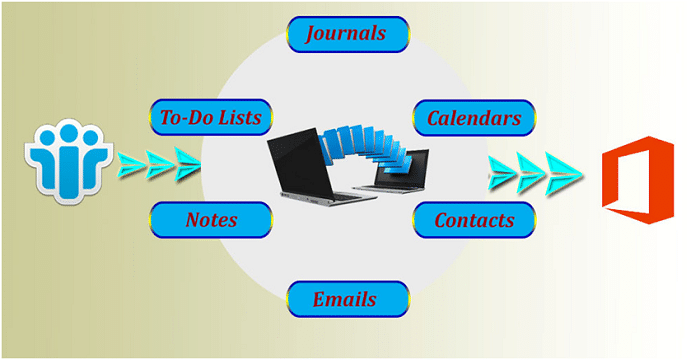 Open NSF file mailbox in lotus notes desktop application. Click on File Menu and click on Export. Suggest a name to the file and select CSV format from “Save as type” option. Open Outlook click on File Menu >> Open and Export>>Import/Export. Suggest a file saving destination to the Notes file. The selected NSF has been converted in Outlook PST format. Give Sharing Permissions to the PST files. Login to Office 365 account>>Admin center >> Exchange. In Exchange Admin Center select Permissions after that select Organization management then Mailbox Import Export. Click Office 365 Admin Center >> Setup and select Data Migration >> Upload PST file. Select Show Network Upload SAS URL and copy the URL >> Download and install Azure AzCopy >> Open Azure Window. Type the command on Azure tool: exe /Source:\\network path /Dest: ”SAS URL” /V: give the location where you want to save log file \AzCopy.log /Y >> press Enter key. Select mapping file then Upload CSV file and Validate then Save it. Select Import Office 365, now the PST file has been uploaded on Office 365 account. Here we described two manual processes of Lotus Notes to Office 365 migration. The user may choose any one of them but if they want a quick, safe and 100% accurate conversion process then we suggest them to use MailsDaddy Lotus Notes to Office 365 Migration software. The tool is reliable and has some advanced features like bulk export, multiple file migration, impersonate export, search mail, various file conversion options etc. Lotus Notes to office 365 migration is increasing day by day because of the popularity of cloud computing. Use the automated tool to get a safe and error-less result.